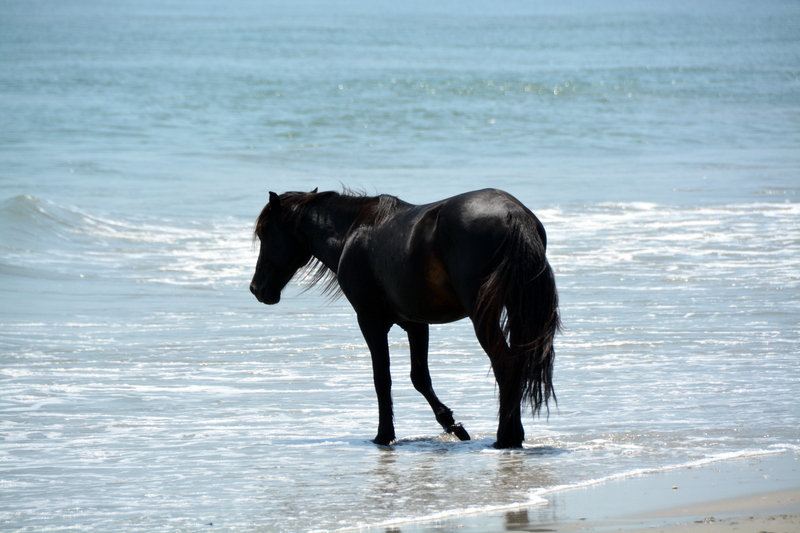 On Monday, Motor Man and I, once again, had the opportunity to take friends up on the beach to see the wild horses. It’s especially rewarding to take those who’ve never had the opportunity to visit that area. 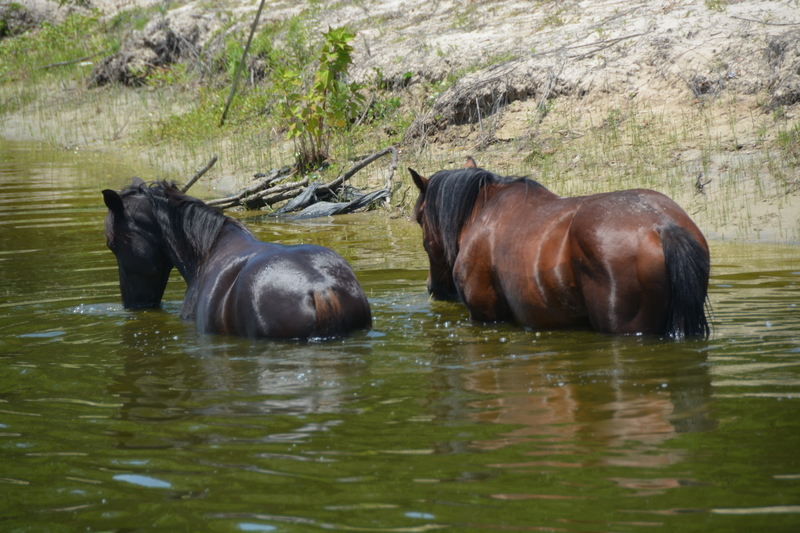 The temps were in the mid to upper 90’s that day, and we saw 65 horses in total. Many were down by the ocean, attempting to stay as cool as possible. 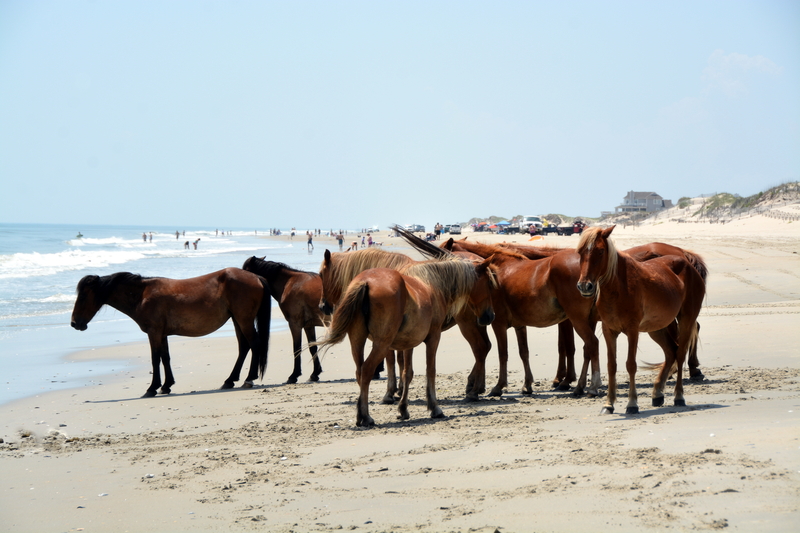 I’ve most likely mentioned this before, but there’s a Currituck County ordinance requiring that people stay at least 50 feet from the wild horses. I think a lesser known “rule” is that, if the horses approach you, you should quietly move away. Although there were LOTS of people on the beach, we didn’t see anyone violating the 50- foot law. And, although in some of my photos, the horses look close, the pictures were taken using my “long” lens. After I upload them to my computer, I usually crop them to bring the image in closer. Horses were everywhere. I think this one is so gorgeous. …including (drum roll, please) three-day-old Guillermo! I had seen his photo on the Corolla Wild Horse Fund Facebook page, and was hoping for a glimpse of him. This was my “treasure” for the day. He is so very tiny; I sure hope he grows strong quickly. …I’d say it was just about perfect. 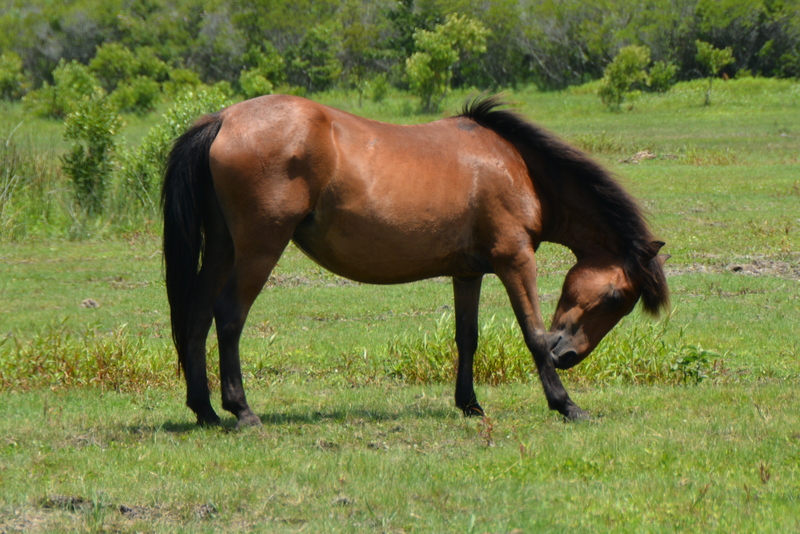 This entry was posted in OBX Wild Horses, Traveling Days and tagged carolla wild horses. Bookmark the permalink. Thanks for those beautiful pictures. I saw where the little one almost drowned in a canal but a passerby rescued him!! Everyone should be so caring of those national treasures! What gorgeous photos…..Little Guillermo is precious! I see June’s posting that he got in a little trouble in a canal – thank heavens someone was able to help him……. Love this post – beautiful photos. Oh my goodness, these are just so beautiful especially that last shot. And the little fellow — so very cute! Aww! What an adventurous day. So sweet. Wow! That had to be one of your best trips ever! Just majestic and beautiful. Thank you! Excellent shots! Especially of Guillermo! Magical and awe inspiring. 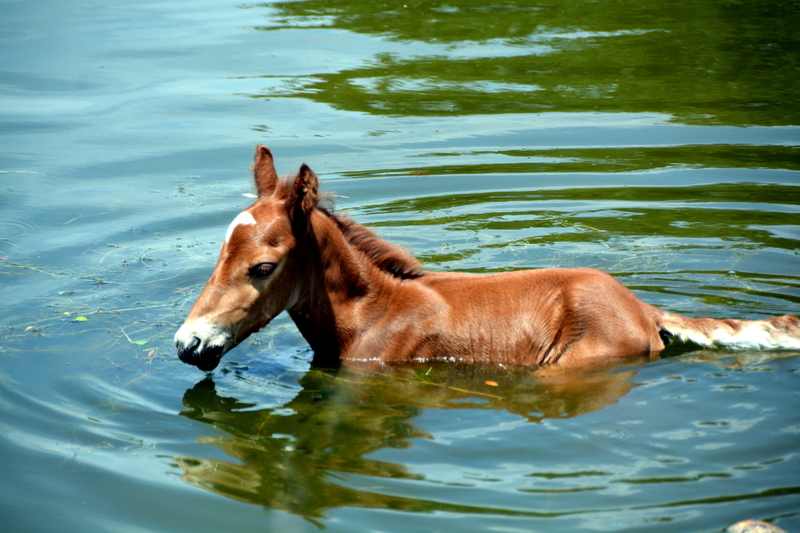 That adorable colt is just amazing and a true joy to see. Perfect – YES!!! WOW – 65 horses – I’d say they’ve come through winter well and that they have so adapted to sharing their space with people. 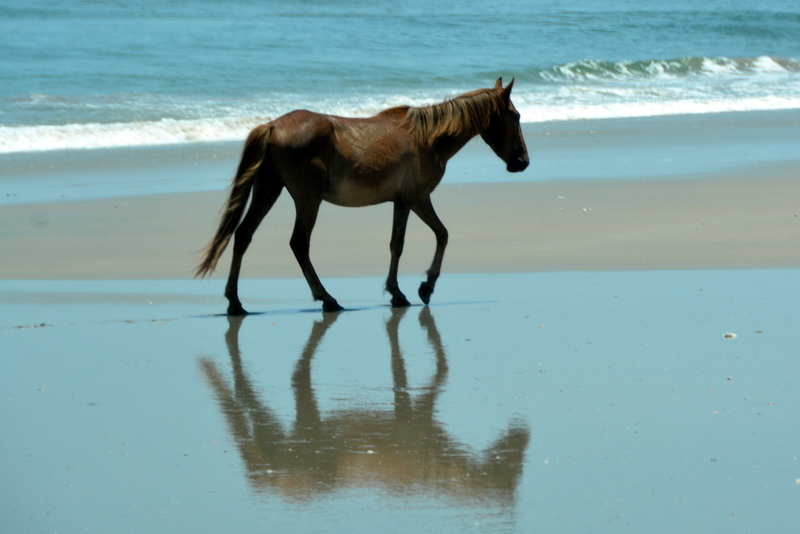 How wonderful to have wild horses so close to you that you can visit regularly. How great!!! All the pictures are wonderful!!! Simply stunning photos of these amazing horses. I’d love to see them someday but will settle for the next best thing. 65! Is that a record number for you? No, I think we’ve seen 70+ in a trip before!